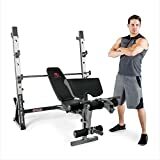 In this review of the Body Champ Olympic Weight Bench, we will take a look at it in detail to help you determine if it’s the right weight bench for you. Our aim is to offer you a clear overview of this product, including its features, specifications, possible workout routines, and user recommendations. 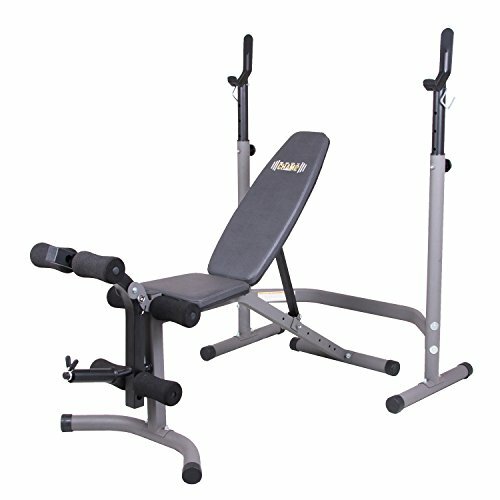 This weight bench is a popular choice among both intermediate and advanced users. This is probably due to its versatility, innovative design, solid construction, and highly adjustable backrest. The strength training bench can be used to work both your upper and lower body. It can also be easily configured in multiple positions for maximum user comfort and strength training flexibility. Let’s take an in-depth look at the bench and its many uses and features! This single piece of fitness equipment is ideal for performing leg lifts, military presses, chest presses, and more. It features a dual-action leg developer that helps you ensure your legs are getting a workout at the same time as your upper body. It has a heavy and robust mainframe that can stand up to heavy use. The fully adjustable backrest can be set to incline, flat, and decline positions. Non-pinching grips and a locking safety hook help ensure user safety during the entire workout. 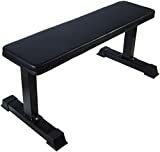 In addition to all of this, the bench comes in models that feature an additional combination bench squat and rack stand. At the end of the day, Body Champ Olympic Weight Bench is great for both new and seasoned users. Weights can be added or removed for multiple uses and difficulty levels. Compatible with just about every weight set brand available, you can customize this bench easily to achieve the results that you desire. All in all, it’s a great way to improve your strength and muscle endurance from home without having to venture out to the gym. There are many different routines that you could use to improve your muscle strength or overall endurance with Body Champ Olympic Weight Bench. We recommend starting out with a comfortable weight limit and working your way up to heavier sets over time. Don’t rush; you’ll be able to use this bench every day if you like. Therefore, you don’t have to worry about cramming a lengthy routine the same way you may have to at a gym. Start by finding your most comfortable weight limits at each backrest incline level. Remember, exercising at too high of an incline angle may cause shoulder joint strain. Declining the bench will help you achieve results in your lower chest. A combination of shoulder presses, (3 sets at 8-10 reps), deadlifts ( 3 sets of 6-8 reps), bench pressing (3 sets of 8-10 reps), and squats (3 sets of 8-10 reps) would be a good place to start. Find your weight limit and decrease it by 20% for your first workout. This will ensure you don’t strain too much at the beginning. After getting used to the bench, increase your weight limit as you see fit over the course of the next month. What’s appealing about this bench is that it is fairly easy to maintain. Be sure to clean the bench regularly by wiping it down after each use. Users can resort to oils to keep weights and steel components in good shape. If you plan on storing the bench outside, avoid leaving it in direct sunlight as this will wear out the foam grips very quickly. Find a dry and temperature controlled storage location to avoid rust and corrosion. Replacement parts can be ordered separately. A manufacturer’s warranty can be requested. This way, you can take a burden off your shoulders and keep training instead with real weights. This bench comes with quite a few accessories. The extra parts include an Olympic plate adapter, spring clip for the leg developer, preacher curl pad, arm curl bar, and an ab crunch with foam grip handle attachments. Every product has a few PROs and CONs. Below, we will examine a few. Adjustable backrest – This bench features a highly adjustable backrest for maximum user comfort and workout possibilities. Solid steel construction – Constructed of steel and other durable materials, this bench stands up well to heavyweight sets and constant use. 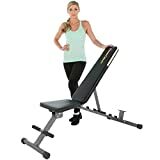 User-friendly design – This bench is great for multiple workouts of your entire body and has a well thought out design. 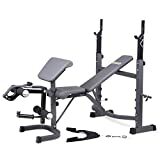 Great value – Body Champ Olympic Weight Bench gives you pretty much everything you need in a home workout gear at a very fair price. 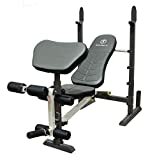 Does not include weight set – This bench does not come with any weight set. In other words, you’ll have to purchase these parts yourself. On the bright side, you can order weight sets to your exact specifications. The stand can be wobbly – Some users report that the weight stand tends to wobble if you don’t screw it together very tightly. This bench has many great users reviews. Below, we have summarized a few helpful ones. All in all, Body Champ Olympic Weight Bench is great for anyone who wants to improve muscle strength, size, or endurance from home. It’s a good overall value and pretty durable. Even though it doesn’t include weights, this bench allows for customization of your own setup. Overall, we would recommend it. If you’ve already given this a chance, let us know your impressions in the comments below!